What are you having for lunch today? A sandwich, by any chance? Ham or cheese, perhaps? How boring! 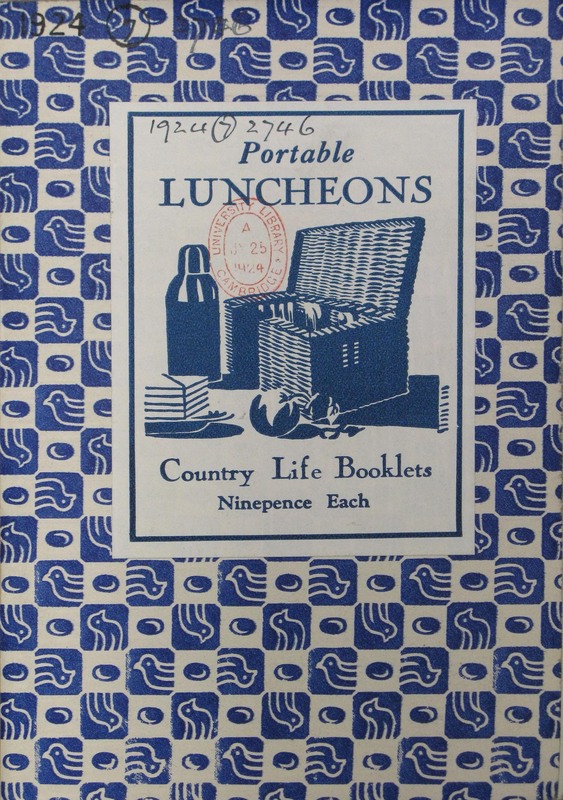 Recently I came across a handy little booklet published in 1924 by Country Life magazine and enticingly called Portable lunches [1924.7.2746]. The author begins by explaining how to make a sandwich properly; the ideal being that they can be “held in a gloved hand, without injuring the glove.” A messy sandwich is clearly anathema to the author: the bread should be evenly cut, with all slices exactly the same size in all respects; butter and fillings should be thinner at the edges so that they don’t squish out, but are still visible in the final article; completed sandwiches should immediately be carefully arranged on the serving dish, with a suitable garnish. Neatness also applies to sandwiches intended for the traveller and these should be tightly packed in a flat oblong shape so as to be easily slipped into a pocket for carrying. 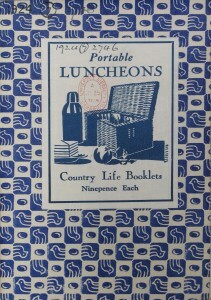 This must be done in such a way that “those who carry a pocket luncheon know that they can with confidence open their packages and not present to the disgusted gaze of any who may be in their vicinity a mingled, mangled, messy mass.” Quite. Now, there are seven varieties of sandwich, apparently: fish, meat, game, green, savoury, sweet and cheese. The meat for sandwiches should always be minced, we are told, never sliced as “the superiority of minced meat is unquestionably greater.” Sausages are the exception – these should merely be chopped into small pieces. There are many suggestions for triple sandwiches, using a different filling for each layer. Recommended combinations include parsnip, mustard and cress with chestnut; liver, mushroom pickle and cold fried bacon fat; or cod’s roe, bacon and tomato pulp. Then again, perhaps you might fancy cheese, apple with vinegar and mustard and peas? Cheese with boiled chestnuts and pickled beetroot? Or, for the sweet toothed, Turkish delight, almonds and preserved ginger? The butter used for any of these creations may be coloured with the juice of beetroot or spinach, or grated lemon or orange peel to make your sandwich even more attractive. So, why not be a little more adventurous with your midday snack tomorrow? This entry was posted in Friday feature and tagged picnics, Sandwiches. Bookmark the permalink. Now I’m really hungry! What a wonderful book. Do they specify that one should peel the cucumber, or is that terribly unfashionable? The author doesn’t specify…. perhaps you were just supposed to know! So hungry! I think I might try some boiled chestnut and cheese sammies. Yum.